Dubai: Top officials on Sunday briefed His Highness Shaikh Mohammad Bin Rashid Al Maktoum, Vice-President and Prime Minister of the UAE and Ruler of Dubai, on infrastructure projects worth Dh6.5 billion. During a visit to Dubai Municipality, His Highness Shaikh Mohammad Bin Rashid Al Maktoum, Vice-President and Prime Minister of the UAE and Ruler of Dubai, said providing a high quality of life for citizens is a key priority for the government. The government seeks to develop projects and find creative solutions for achieving the strategic objective of ensuring sustainability and providing services for citizens, residents and visitors that meet the highest international standards. This helps ensure that the UAE remains a development model centred on the happiness of its people. 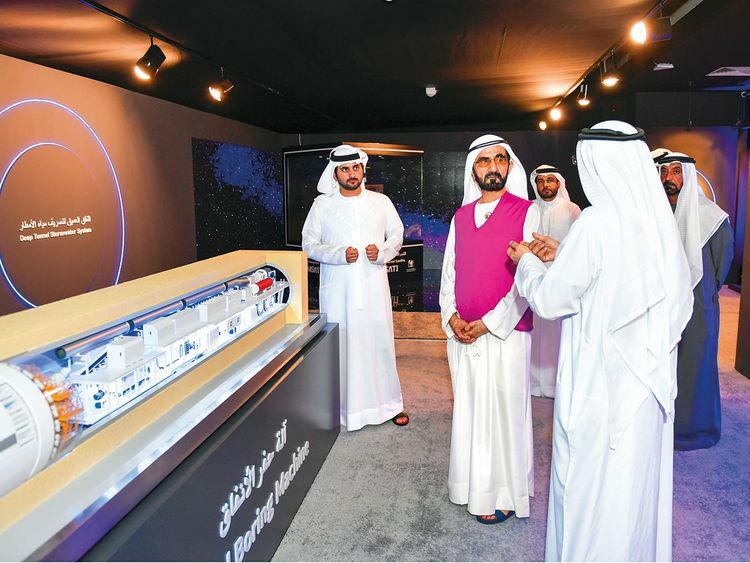 The Dubai Deep Tunnel Storm Water System is the first project of its kind in the Middle East that aims to collect and convey groundwater and stormwater runoff, and then store it and direct it to the sea. The project is critical to face the future challenges coming from rains over the next 100 years. The project has a capacity of 110 m3 per minute (6600 tonne per minute), which is double the flow of the Thames River in London. The Dubai Deep Tunnel Storm Water System will drain 40 per cent of the entire area of the city. It will serve the whole of Dubai South, which is home to Dubai’s Al Maktoum Airport and the EXPO 2020. Shaikh Mohammad was also briefed about the world’s largest single waste-to-energy plant, built on two hectares of land in the Warsan area. The plant will consume the city’s solid, industrial and commercial waste and convert them into electricity. Gases produced by the waste will be burned in order to turn a steam turbine to generate electricity. Incombustible material will be left as recyclable ash, from which useful metals can be extracted for reuse. The gas will be treated with lime and filtered to minimise the release of pollutants during processing. Other projects he was briefed about included the development of traditional souqs in the Deira and Bur Dubai areas, which are set to attract 12 million visitors by 2020. Shaikh Mohammad praised the efforts of the municipality, and the positive outcomes of its projects that will further support the strategic objectives of Dubai.